The National Association of Realtors is reporting that in June existing home sales (which excludes new construction sales) rose for the third straight month. Sales rose to a seasonally adjusted annual rate of 4.89 million units. This represents a 3.6% increase from May. As housing is a leading economic indicator, the stock market responded positively today to the news. All of the major markets showed sizeable positive gains. While housing is not yet out of the woods, the emerging trends are encouraging. On the local front, we reported earlier in the month that June home sales were up over last year’s number. That is only the third time in the past 27 months that our local market has experienced a year over year increase. The return of affordability is bringing buyers back. Establishing a new baseline of affordability has been the roadmap to recovery in other parts of the country. In the hardest hit regions of the country, California, Florida, and Arizona, average prices have returned to affordable levels and that has brought the buyers back in a big way. 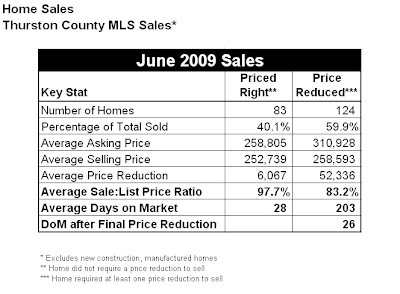 Sales in California, for example, shot up 35.2% from May 2008 to May 2009. Homes there were inflated way beyond sustainable levels. Prices are off 30% from a year ago, bringing them back to affordable levels. This in turn has brought the buyers back. 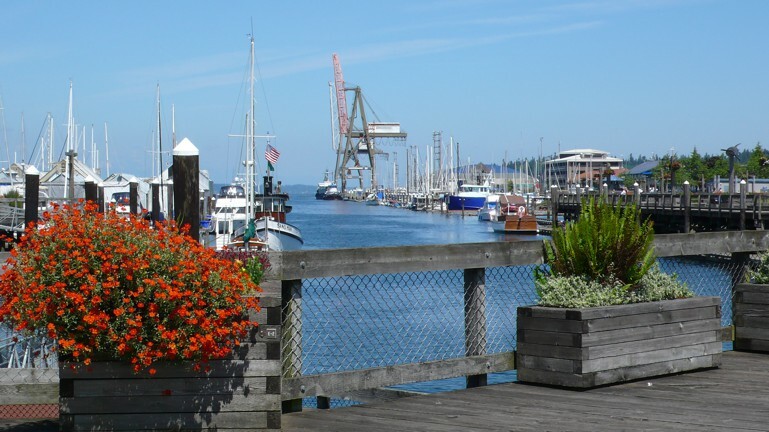 The Pacific Northwest in general, and our area in particular, was about 18 months behind the rest of the nation in the market correction. We are now playing catch up. To the extent a home is priced right, it is selling. When it is overpriced, no matter what price segment the home is in, it is not selling. Most of the sales are concentrated in the lower price segments, particularly below $250,000. In that category we still see a heavy influence of bank-owned and short sale properties. They accounted for 28% of all sales below $250,000 last month (that number climbs to 53% below $200,000). Those distressed properties are being offered by very motivated sellers who are pricing the home at today’s market values. We still see the majority of homes, particularly at the upper price ranges, being priced above market value. Price is the one thing that is keeping our market from experiencing more sales. The buyers are out there and are willing to act quickly when they see that value. They are also showing great discipline in avoiding overpriced properties. The good trend for our market is that more sellers understand the current environment and are pricing to it. At the start of the year, only 71% of sellers over-priced their home, meaning that they required at least one price reduction before selling. In June that number dropped to 60%. This figure is extremely important for sellers because overpriced homes are on the market an average of 203 days. Last month, homes that were priced at market averaged just 28 days on market.